Voices of Safe Staffing - Nurses Know What Patients Need! Nurses across the state are sharing their experiences and demanding staffing that ensures the safety of patients and nurses. As the professional organization that represents nurses across the Commonwealth, independent of role, education, or union affiliation, we want you to know that we are advocating on behalf of you! I want to first thank all of the members of ANA Massachusetts who worked tirelessly to have our voice heard this election season. Our nurses wrote articles, debated, knocked on doors and held signs on election day to educate the voters of Massachusetts regarding the unintended consequences of Question 1. However, now we are faced with a greater challenge. This election season nurses in the Commonwealth became divided on the staffing issue when our unified goal is to provide our patients with high quality care. Let’s join together and work together to achieve these professional goals...continue click here. Nurses across the state are sharing their experiences and demanding staffing that ensures the safety of patients and nurses. As the professional organization that represents nurses across the Commonwealth, independent of role, education, or union affiliation, we want you to know that we are advocating on behalf of you! Please click here to read the final Health Policy Commission Safe Staffing Regulation. Please click here. to read the testimony that our organization provided on this subject to the state’s Health Policy Commission. Donna Glynn, ANA MA President, Lobby Day presentation, click here. Please click here to view video excerpts of ANA Massachusetts leaders and members speaking about the topic of safe staffing. 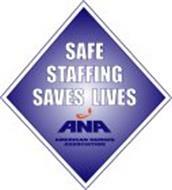 Please click here to go to the ANA Safe Staffing Saves Lives website for additional information. Click here to view ANA Massachsetts position on Staffing ratios as a ballot question. Click here to view chart outlining the ANA position difference from the MNA ballot language. Click here to view one page outline of the ANA staffing legislation. Click here to view ANA’s Registered Nurse Safe Staffing Act re: balanced approach to legislation. Click here to Take Action on ANA Safe Staffing Bill. As the state affiliate of the American Nurses Association, the oldest professional nursing organization, ANA MA ensures that the voice of nurses is heard across the Commonwealth and across the nation. ANA Massachusetts strives to help registered nurses across the Commonwealth stay up to date on the major issues that affect their practice. We are here to serve you. aRe you iN? More safe staffing information, click here. ANA Mass testifies to the Massachusetts Health Policy Commission on important staffing regulations. ANA Massachusetts Testimony, click here. ANA Massachusetts Member and Staff Nurse Gayle Peterson testimony, click here.